Six valued fish to breed. Fancy a way of making your hobby closer to self-funding? Steve Baker looks at six options that could help bring in the pennies. Lots of people have the idea of breeding fish to sell on. Financially, some are aiming to supplement their hobby, to bring some of the costs back. Some people are after a little profit out of it – some pocket money. Other people have grand ideas of watching the money fill the front room. In reality, many people have great breeding successes with the wrong fish. They may be easy to breed and easy to move on but have very little or no value commercially. Or they may be fish which are slightly trickier to breed and hold a better value but are hard to move on because the demand just isn’t there for behavioral or aesthetic reasons. 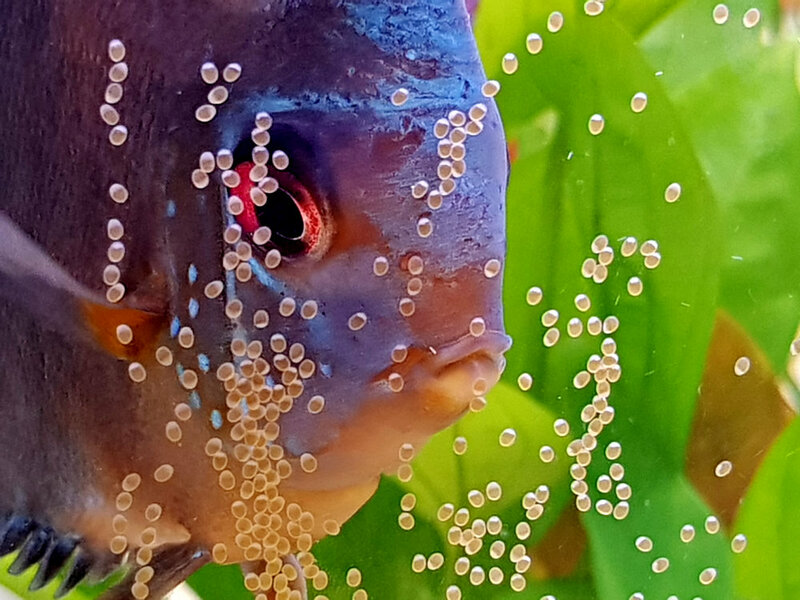 If you want to breed a particular fish because it appeals to you or you want to raise awareness, then that’s great and should definitely be encouraged, but if you’re looking for some profit we’ve got a few suggestions – but you won’t be giving up your day job! It simply costs too much in water and electricity in the UK to be easily, commercially viable. Let’s start off with a reasonably easy target. For Dwarf cichlids, I’m mostly thinking about Apistogramma spp. At £25 - £50 per pair they won’t set you back the earth to get brood stock and their needs are quite simple. An average 75cm tank, air-run sponge filters, a heater-stat, some terracotta flower pots and some leaf litter, wood structures or plants are what you need – nothing to tricky or expensive. They like their water soft and at least slightly acidic. It’s best to buy a small group to start with and wait for a pair to form. Condition them with frozen and live foods for a couple of weeks and if they are being stubborn try mimicking the coming of the rainy season with a cool and soft water change. Realistically you’ll need to hatch your own Brine shrimp to feed the free-swimming fry and they’ll need regular feeding and regular water changes. It takes a fair while for the fry to get to a saleable size and showing some colour which is one of the reasons they hold a stable value. With the concern of weakened genetics occurring through mass production of fish there has been a rise in recent years for F1 and F2 fish (the ‘F’ number denotes how many generations they are away from wild parents). If you can get your hands on some wild brood stock, it immediately adds value to the offspring. This spans South American, Central American and most cichlids worldwide but the main demand area it seems is with Rift Lake Cichlids (where genetics can get confused more easily). The trick here is to settle the brood stock in. They will want their natural water parameters replicated and, at least initially, tank furniture should be familiar for them. The size of the tank and tank-mates will depend on the species but spacious would be the target for wild fish. They may need tank mates as dither fish, for some confidence boosting but these will need to be quick, robust and large enough that they won’t become dinner and gentle enough that they won’t upset your newly captive brood stock. Discus have always held a high value, partly because of their timeless beauty but mostly because of the difficulties of breeding them. It’s expensive to set up a breeding project. For a start, you’re looking at multiple tanks for growing on and maybe separate tanks for brood stock, high quality water conditions, Brine shrimp hatching equipment and a high food bill. If you happen to have ideal water coming out your tap it’ll cut a large bill for RO water (or an RO unit and water bills) as many water changes are needed. The rise of the European tank bred Discus has boosted the market over recent years, mostly because they are happily kept in slightly harder and cooler water conditions compared to wild fish or Malaysian tank bred individuals so, for best desirability obtain European brood stock. They will be dear to purchase, if you want a mature, proven breeding pair you’re looking at around £180.00 for basic colour variants. Buying a group of smaller, immature fish and hoping for a pair to form would take an awful long time or possibly a pair would never form. You won’t need to plow as much money into the set up as you would with Discus but Zebra plecs are tricky to breed and nurture the young. Water quality is of upmost importance and softer conditions are preferred so again, RO costs will be necessary for most of us in the UK and they aren’t the most productive of fish laying around 15 eggs to a batch. Another issue is the cost of brood stock but the bonus of that is the sale price – regularly seen at £150 in the shops, a sale of upwards of £90 is realistic. Common Clownfish have been commercially tank bred for many years now and hobbyists have success with them too. There are two ways at looking at breeding Clowns. At £25 in the shops the normal common clown has a good value and, as far as marine fish are concerned, they are easy to breed with good sized batches (up to 1000 eggs) so the numbers game works. The other way to do it is to breed your own strain. So many variations of Clownfish are now available and the value can be much, much higher than the natural strain with Picasso and Snowflake varieties doubling the value and some variants pushing way past the £100 barrier. If you can develop a viable unique variant you’re in the money. This one is about following trends and this trend is still current. Now here’s a demanding target. Breeding tangs in captivity is not the norm, and until recent years we thought it impossible or next to, but it’s been done now so it is possible. Getting them through the early planktonic period is the real challenge, providing the right plankton foods in enough volume while keeping water quality high. The thing that makes me include the humble Yellow tang is the sudden rise in cost. Due to bans and pressure being put on wild marine fish collecting we have seen Yellow tang values go from £35 to £100 almost over-night (shame you weren’t buying brood stock two months ago). There’s also the thought, if you can breed yellows you could probably breed even higher value Tangs too, and you might make some money out of writing articles about your success too.